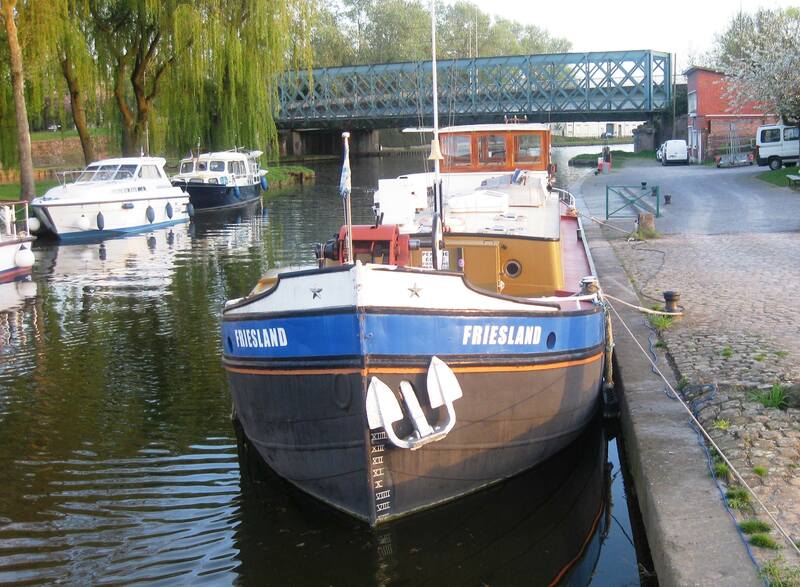 When we arrived in Cambrai Port at 8 pm after our first long day’s journey from Douai we moored in the only space we could find in front of a boat called Friesland. I could not find electricity or water so we just moored up for the night. The next morning I met Tam and as described in a previous blog he helped me connect up the electricity and water. Di his wife was very welcoming and invited us over for drinks that night. We had a great time with them and they gave us loads of information. We discovered that they had been cruising in France for 15 years and ran a barge handling training school from the boat. They talked us though the route from Cambrai to Paris including the Grand Souterrain and they really helped us handle the next leg of our journey. Without their clear precise instructions I don’t think we could have managed the tow through the tunnel. They have built up such a profound knowledge of boating in France it’s amazing. They told us that they had four people coming on Thursday night for three days training and they invited us to join them all for dinner at Le Petit Chief Restaurant which was right beside the quay side. 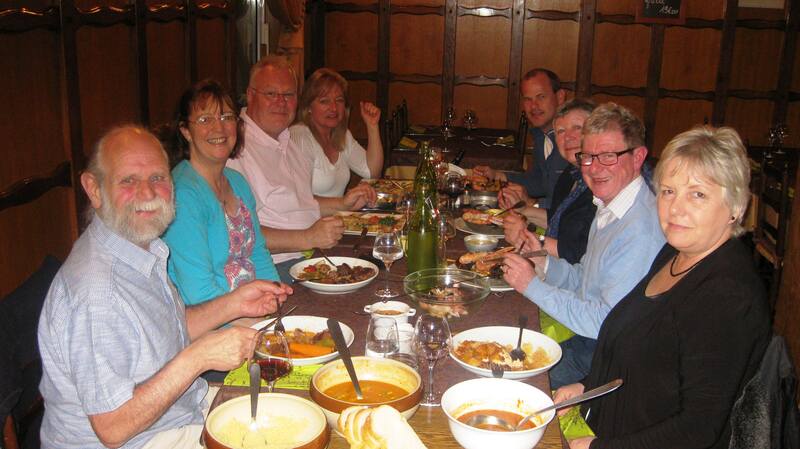 We went for dinner that night and meet the Debbie and Neil and Jenny and David. We had a wonderful meal and they were great company. All have very interesting lives- Tam & Di have operated this boat training school for many years and split their time between the boat based in Cambrai and a home in London. Debbie and Neil have sailed all over the world as professional crew for wealthy boat owners and Jenny and David own a hotel barge and hope to take it to the South of France next year. What interesting people all following their dreams. The fact that Tam & Di were so welcoming and helpful was brought home to me two days later when we got to Saint Quentin and meet Lynn and Stuart on their barge. They told me that they had left Cambrai the previous Thursday and were full of chat about Tam & Di we had obviously taken their mooring, the next day. 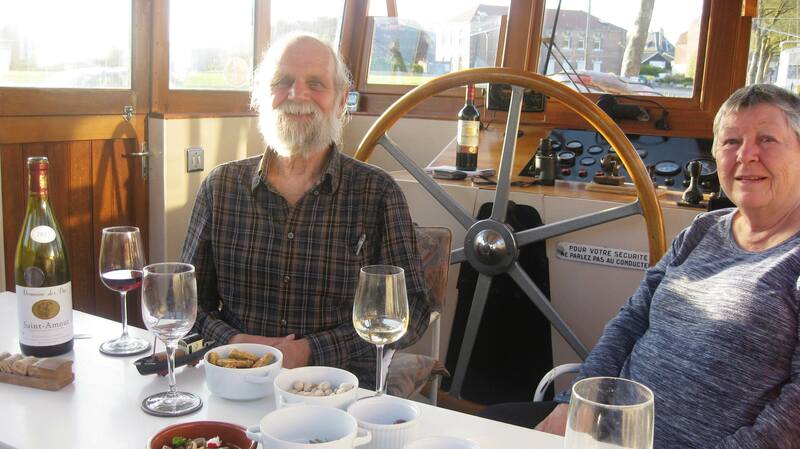 Then I got an email from Charles who we had meet in Douai who told us he had just moored in Cambrai in our mooring (he was obviously reading the blog), the day after we had left and had just meet Tam & Di. So it obvious that Tam & Di are having a constant stream of visitors to the mooring in front of them and they are giving them all the same welcome, friendship and help. Now that’s true good nature and helping your fellow man! I hope they never retire and keep helping all the cruising people coming through Cambrai. Once again thanks a million Tam & Di and we hope to meet you again soon. This entry was posted in People We have Meet on the Gap Year, People who have helped us on our way, Uncategorized and tagged Cambrai, people who have helped, Tam. Bookmark the permalink. Thanks Pauline. Say hello to Seamus for me. Tell him sorry we did not make contact before I left but he is welcome to ring me anytime on my mobile. he has the number. Charles confirms all this. In fact, a week after arriving he is still here enjoying sharing hospitality with Tam and Di (in between the 2 courses they have run this last week). Another DBA barge Esme also pulled in for a night the day after us and Chris and Diana are still here and we are having quite a social round. My liver needs a rest! Be quite Charles you are letting out our secret! !